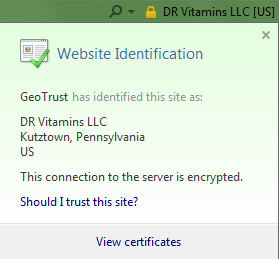 At DR Vitamin Solutions we place the highest level of priority to safeguard and protect your private information. We will only use the information you provide to process your order, reply to your questions, and only if you opt in, to provide you our email promotions newsletter. We will not give, sell, or rent your personal information, including email address, or specific account activity to anyone for any reason without your prior consent except as required by law. AES-256, 256 bit Secure Sockets Layer (SSL) technology for secure Internet Protocol (IP) transactions. Once you are in the checkout process, you can verify that you are accessing our secure by looking to the right of the location bar in newer browsers, or at the lower left or right corner of your browser for older versions. If you see an unbroken key or a closed lock (depending upon your browser), the SSL is active. You can click this image of the lock to see verification. You may also notice on newer browsers a “green” color where the web address is indication full protection (see image to right). To double-check for security, that you have accessed our secure server, the first characters of the address in that line should change from “http” to “https” once you are at the checkout.